A spokesperson for the Scottish Government said the funding aimed to help "banish the scourge of period poverty" among the country’s 395,000 pupils and students. The announcement builds on significant work undertaken by campaigns such as Free Period Scotland, research undertaken by Young Scot, Engenderand Trussell Trust, and pilot schemes from schools, colleges, local authorities, homelessness and women’s charities across Scotland. “Having expressed our full support for these provisions in various ways over the past year, we are delighted to hear this news. “We responded to Monica Lennon MSP’s consultation on the Proposed Sanitary Products (Free Provision) (Scotland) Bill, acknowledging the financial burden of sanitary products, particularly for girls and young women who are experiencing poverty, and recognising the proposals as important for upholding UNCRC rights to education and the best health possible. “We also highlighted the issue in the December 2017 edition of our magazine. 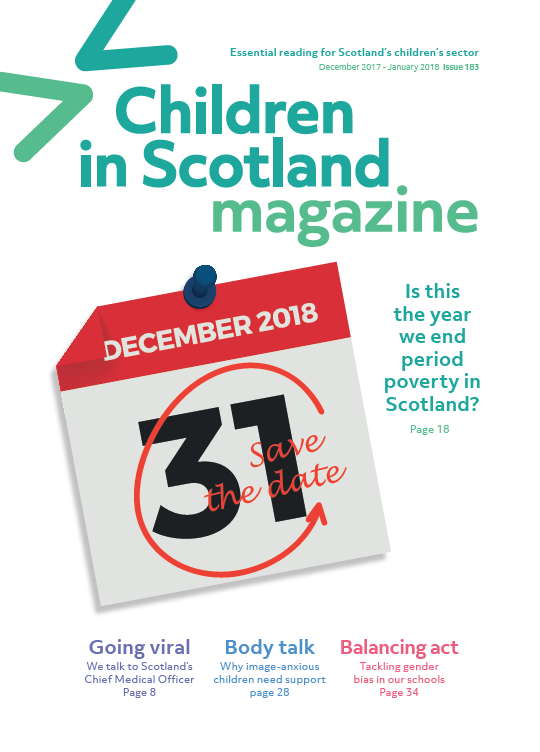 In the cover article headlined ‘Is this the year we end period poverty?’, Alys Mumford and Emma Trottier from Engender explained why we need to ensure better access to sanitary products and appropriate legislation. Access the December 2017 edition of our magazine here. Members can access the December 2017 edition of our magazine here. Read our response to the Proposed Sanitary Products (Free Provision) (Scotland) Bill.